SPAG is a voluntary association created by the local governments within state planning region two. 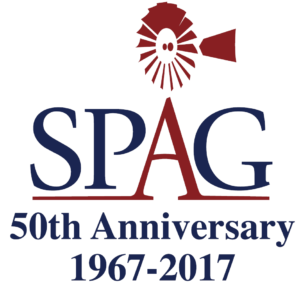 Authorized by state law, SPAG is an independent political subdivision of the state and is an instrument of local governments. It is one of 24 such organizations in Texas. The SPAG planning region, delineated by the Governor, encompasses 15 counties covering 13,737 square miles. Approximately 60% of the region’s population is located in Lubbock County, which is geographically centered in the region. The economy is dominated by agriculture, agribusiness, and service industries. Any local government in the 15-county area is eligible for membership in the association. All 15 counties, 46 cities, and 9 special purpose districts are participating members of SPAG. Recognizing that more can be accomplished by acting together rather than alone, local governments created their association as a service organization for themselves. SPAG is charged with representing the interests of local governments of the region and facilitating orderly development of the economic, social, and physical environment. Acting through SPAG, local governments create opportunities based upon local needs and preferences.